The European Union has decided to fine Google an unprecedented $2.7 billion after a years-long investigation into the company’s comparison-shopping product found that it unfairly favored itself over competitors. 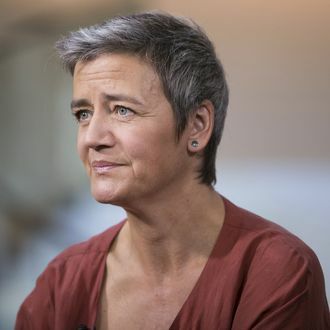 The EU’s antitrust chief, Margrethe Vestager, charged that similar products competing with Google were often ranked much lower in search (if you’re not on the first page, you’re basically dead). Google now has 90 days to change how the product operates. In response to the fine, Google general counsel Kent Walker defended the tool, noting that “our data show that people usually prefer links that take them directly to the products they want, not to websites where they have to repeat their searches.” The company is mulling an appeal. Setting aside the enormous fine, the decision has larger implications for U.S.-based tech titans that do business worldwide, and specifically the EU, where antitrust regulations are much more stringent than America. Google is currently facing at least four other antitrust probes, including ones related to its Android mobile operating system and its advertising platform. The EU’s approach to near-default companies like Google is that they are not simply tools for browsing the web, but influence peddlers on an unrivaled scale. In choosing to wield its regulatory power openly, the EU — and vocal members like Germany, which is reconsidering online space as a free-speech haven — has a huge opportunity to determine the course of the internet. And if American companies want to do business there, they have little choice but to comply.